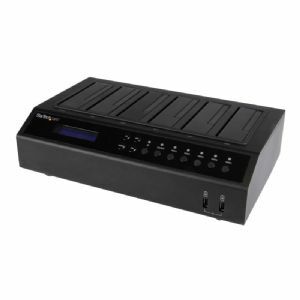 The SATDOCK5U3ER Hard Drive Duplicator & Docking Station lets you clone a 2.5in or 3.5in SATA hard drive (HDD) or solid-state drive (SSD) to five other SATA drives simultaneously, as a standalone device. The duplicator also lets you erase up to 5 drives, without a host connection. You can also use the duplicator as a 5-bay HDD / SSD docking station, by connecting it to a host computer system through either USB 3.0 or eSATA. With support for high-capacity drives (tested with up to 6TB), this is a simple and cost-effective way to boost your data storage/backup capabilities. By copying data from one drive to five drives simultaneously, the hard drive cloner helps boost your productivity by avoiding the hassle of repeatedly swapping drives in and out during high volume duplication projects. Plus, the dock supports erasing up to five drives simultaneously with multiple operating modes, including Quick Erase as well as Multipass Overwriting (DoD) -- the ideal solution for permanently erasing confidential information and helping to protect your business and your clients from identity theft. 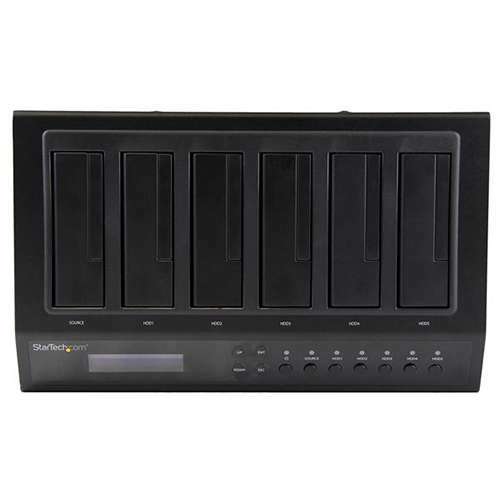 With a built-in LCD display, the SATDOCK5U3ER makes it easy to monitor duplication progress and review copy/erase results and drive diagnostics during standalone operation. The housing has also been specifically designed with ease-of-use in mind. The drive slots feature a dual-profile design to support hassle-free swapping between 2.5in and 3.5in hard drives and solid-state drives without having to use additional brackets or adapters. 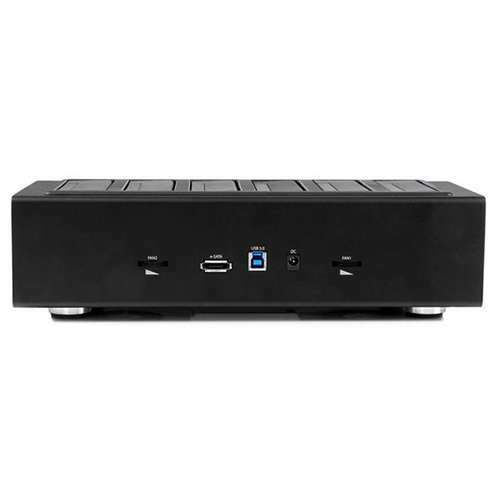 With the option to connect the docking station through either eSATA or USB 3.0, the SATDOCK5U3ER provides a versatile solution for expanding the storage capability of almost any laptop or desktop computer. 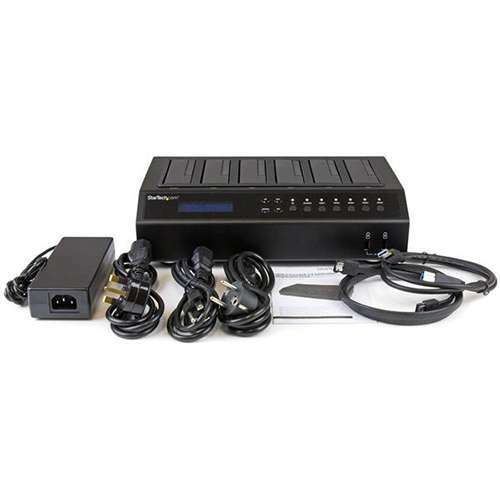 For fast performance, you can connect the docking station to your computer through eSATA for efficient data transfer speeds up to 3 Gbps. For broader system compatibility, you can connect the dock through USB 3.0, which is also backward compatible with USB 2.0/1.1 host connections. The SATDOCK5U3ER also provides two charge-only, fast-charge USB ports, that you can use to keep your iPhone®, iPad®, and Android™ tablets or smartphones charged. 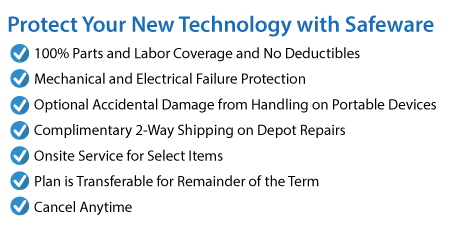 Built for dependable, long-term performance the SATDOCK5U3ER is durably constructed and backed by a StarTech.com 2-year warranty and free lifetime technical support.